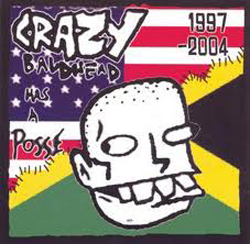 Home > Vinyl > 12" > Vinyl LP: Crazy Baldhead "Has a Posse"
Also available with accompanying full-color CD-sized (4.75" x 4.75" square) sticker with download code printed on the peel-off backing. Download includes extended versions and bonus tracks! A wicked mix of Dub, Dancehall, Reggae, Ska, Trip-Hop, and Rock helmed by NYC Ska stalwart Agent Jay that features an All-Star cast of musicians, including King Django, Vic Ruggiero, Rocker T, members of The Slackers, Stubborn All-Stars, and more. Agent Jay has carved a deep niche for himself as the guitarist for Agent 99, Stubborn All-Stars and now the Slackers. Recorded in stolen moments between 1997 and 2004, Has a Posse offers a lush and stunning ska-skinhead reggae-dubwise journey through the musical mind of this original NYC Ska Mobster. Featuring an all-star line-up including Victor Rice, Victor Ruggiero, King Django, Rocker T, Eddie Ocampo and Buford O'Sullivan.